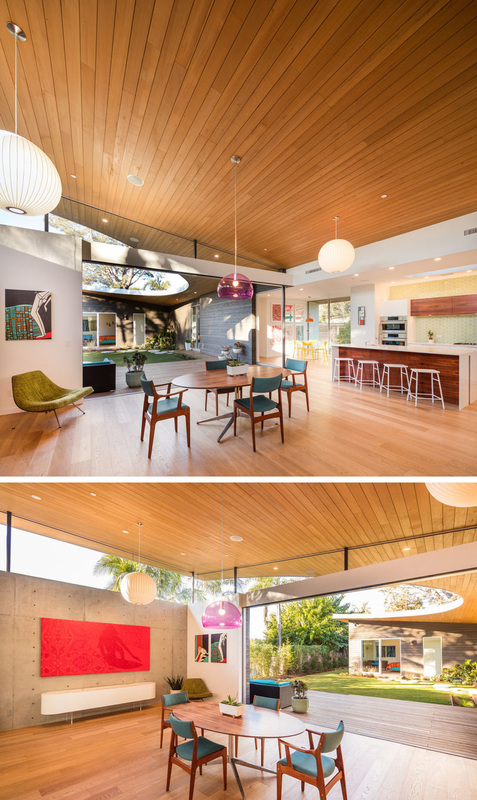 Surfside Projects together with architect Lloyd Russell, have completed the Avocado Acres House in Encinitas, California. 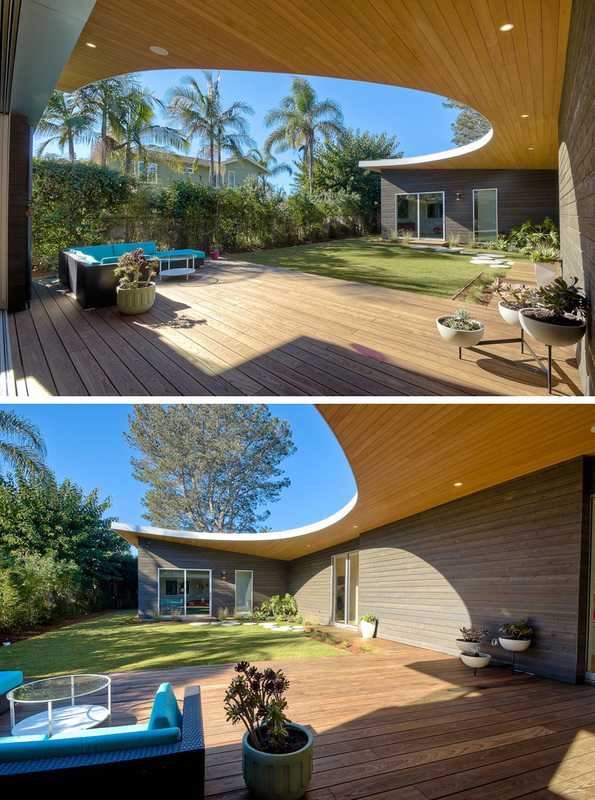 This unique home has a curved roof, creating a U-shape floor plan. The front of the house features the slanted, angular part of the roof. A bright yellow door framed by two windows guides you inside the home. Looking out on the wood patio, a curved roof with hidden lighting is revealed. Bright blue patio furniture provides a nice place to lounge outside. 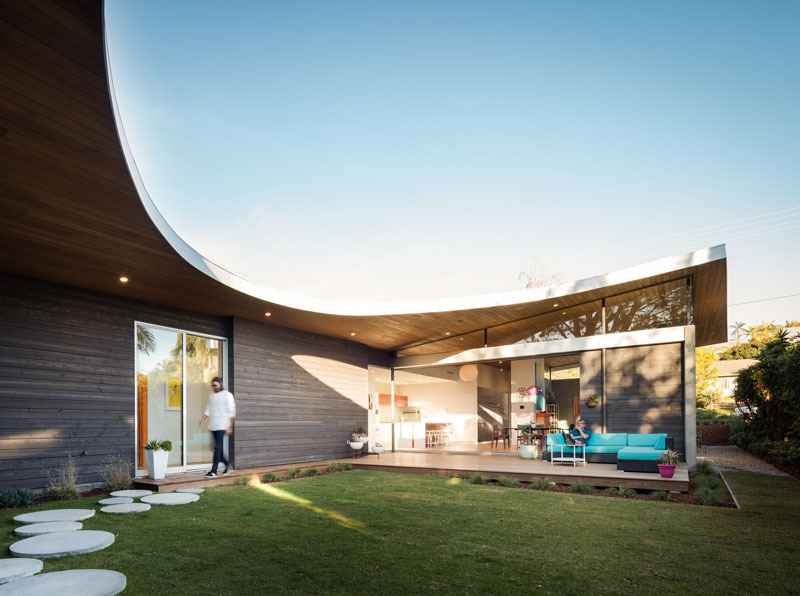 The curved roof slopes upwards, providing space for a set of clerestory windows. Circular stone steps create a path through the yard, connecting different spaces. 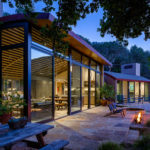 Large sliding doors connect the interior and exterior spaces, ideal for indoor/outdoor living. Inside, the dining area has a purple glass pendant lamp hanging above a wood dining table with blue upholstered chairs. 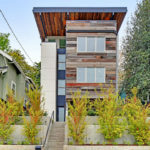 Around the corner from the dining room is the living room, that features concrete walls with a wood ceiling and floor. Retro toys, wood furniture and artwork adds character to this relaxed space. A white and black fireplace stands out and keeps the space warm. 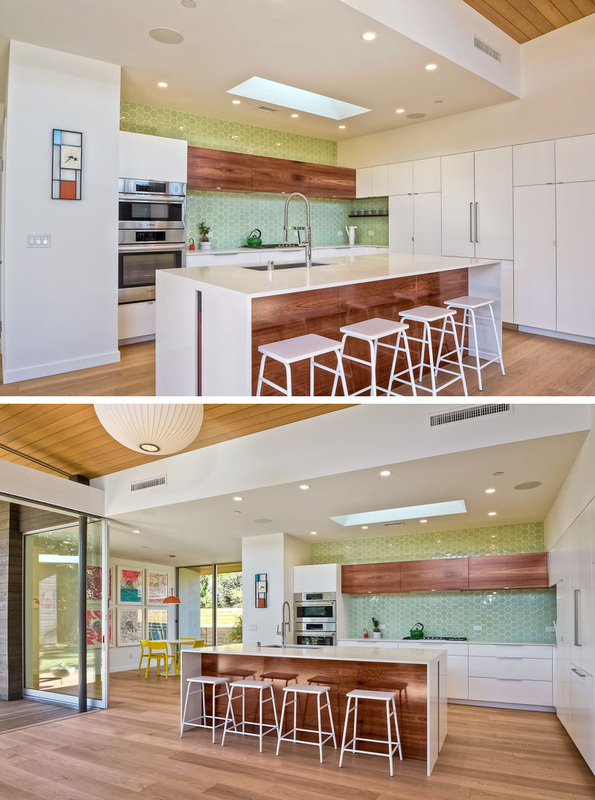 On the other side of the dining room is the kitchen, where light green hexagonal tiles are used as a backsplash. A large white and wood island compliments the white and wood cabinets used throughout the kitchen. Off to the side of the kitchen is the breakfast nook. 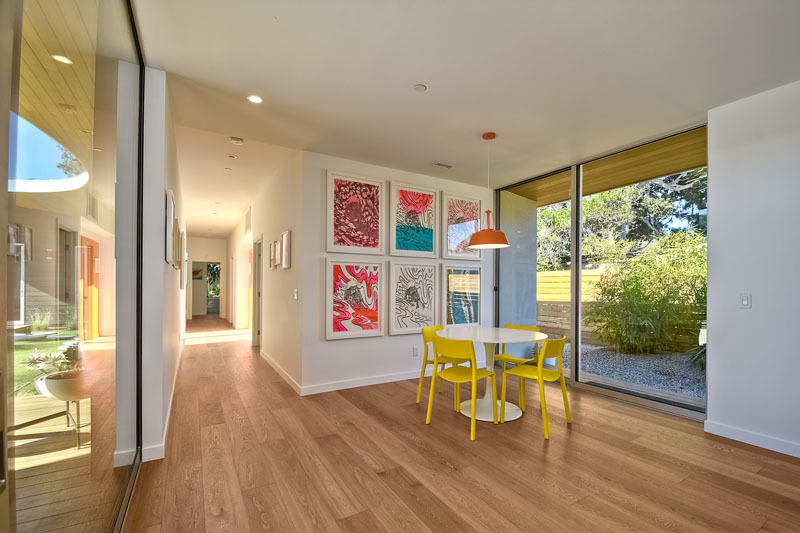 A white table with yellow chairs, sits below a bright orange pendant lamp, while a sliding glass door provides easy access to outside. At the end of the hallway is the master bedroom and master bathroom. 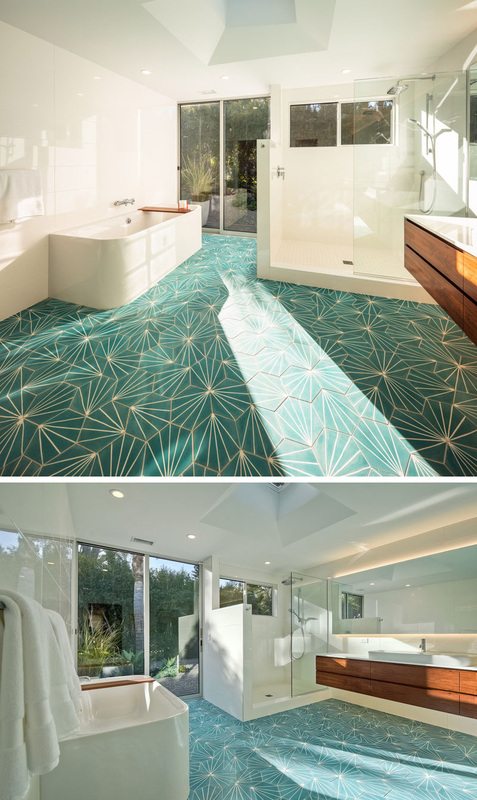 The bathroom is mostly white, except for the bright pop of color of the tiled bathroom floor. 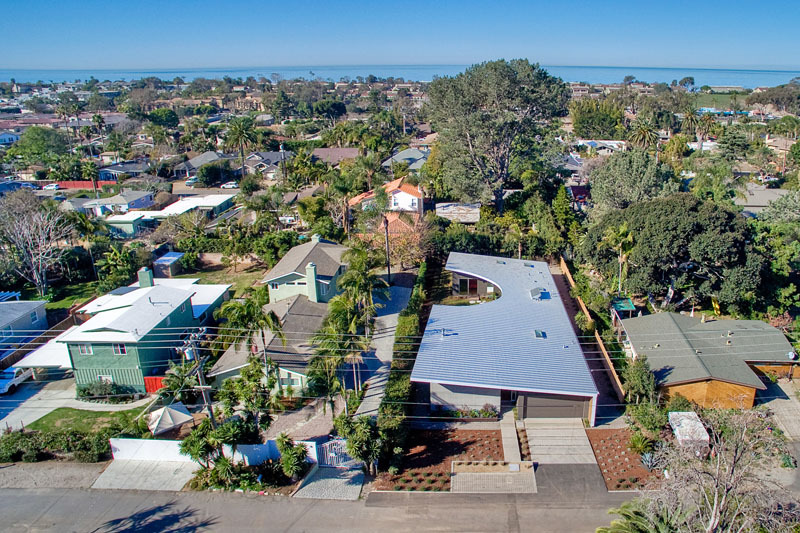 An aerial photo shows just how unique the curved roof of the home is. 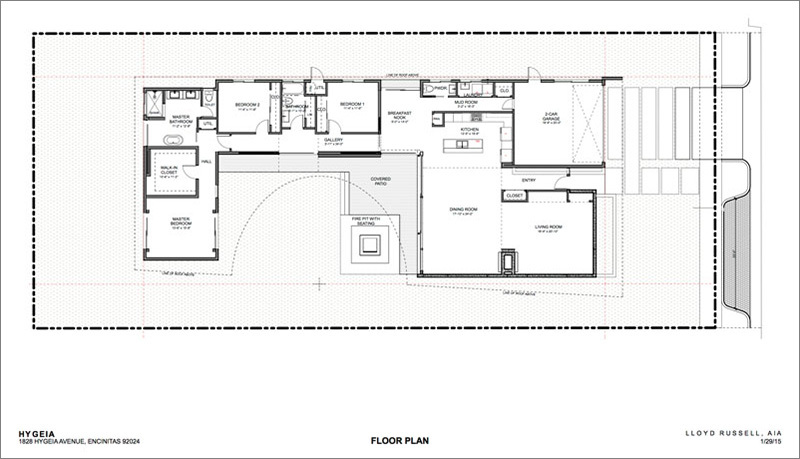 Here is a look at the floor plan of the house.